Patricia joined TLIE’s claims department in 2013. Prior to becoming a claims attorney for TLIE, she was an in-house litigation attorney for a national title insurance company. 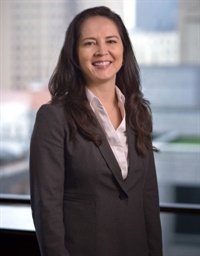 She began her legal career in private practice before transitioning to in-house counsel positions for insurance companies. Patricia works diligently with TLIE’s insureds and defense counsel to provide the unsurpassed customer service for which TLIE is known. She is conscientious and mindful of the impact a claim may have professionally and personally on an insured. She works meticulously to achieve a satisfactory and expedient resolution of the claims that she manages. Patricia is an honors graduate of the University of Texas School of Law. While in law school, she had the distinct privilege of serving as an intern for the Texas Supreme Court as well as the U.S. Court of Appeals for the Fifth Circuit.